Here's the continuation of our breakdown of the 2014 CFL Draft's zany first round, which involved five trades and plenty of drama. Pick #5: B.C. sends pick to Ottawa for QB Kevin Glenn, Ottawa sends pick and 10th overall pick to Montreal for fourth and 13th picks, Montreal takes Montreal Carabins OL David Foucault. 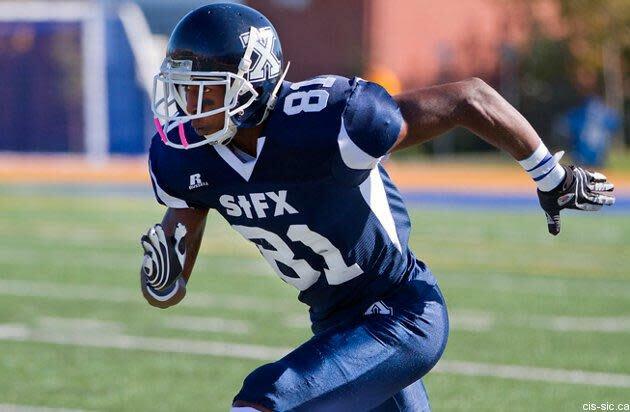 Pick #6: Toronto sent this pick, the 15th overall pick, OL Tony Washington and DB Otha Foster to Edmonton for the third and 21st overall picks, Edmonton took St. Francis Xavier X-Men receiver Devon Bailey. As mentioned above, this looks like a really nice move for the Eskimos, as they managed to move down in return for a couple of promising players (Washington in particular might help solidify a line that was terrible last season) and still grabbed a great player. Bailey looked like the best receiver in this class by far, and he should help further improve an already-dangerous Canadian receiving corps that also features emerging stars Shamawd Chambers and Nathan Coehoorn. Yes, everyone expected the Eskimos to try and build their Canadian content on the line a bit more, but this draft wasn't deep on linemen, and there wasn't a great option available either at #3 or #6. Bolstering their Canadian receivers might make it easier for them to start more imports on the line, perhaps including Washington. It's a bit of an unconventional approach, but it's one that could definitely work. Pick #7: Calgary takes Concordia Stingers DL Quinn Smith. Yes, Smith's positive drug test is somewhat concerning, but there's next to no punishment for him unless he tests positive again. As long as the Stampeders aren't concerned he'll get in more trouble, this is a fantastic pick. Smith had a great CIS season and was named Concordia's MVP after playing both on the defensive and offensive lines, and he impressed enough at the combine that he was being touted as a potential first-overall pick before his positive drug test. He's a versatile player who could be a tremendous presence on the defensive side of the ball, or even perhaps a capable offensive lineman. Getting him this late is a steal, unless the drug test turns out to be a sign of a recurring problem rather than a once-off. Pick #8: Hamilton traded this pick to Saskatchewan in February with DL/LB Shomari Williams and P Josh Bartel for the 9th and 11th overall picks. Saskatchewan then trades it back to Hamilton Tuesday for the 11th and 17th overall picks. Hamilton takes Western Mustangs LB Beau Landry. Pick #9: Saskatchewan traded this pick to Hamilton in February with the 11th pick for the 8th pick, DL/LB Shomari Williams and P Josh Bartel, Hamilton takes Manitoba Bisons DL Evan Gill. As mentioned above, this offseason trade worked out pretty well for the Riders. At the time, it seemed to work out well for the Tiger-Cats, and it was a key part of what allowed them to move up to #8 in this draft as well. However, what they did with this pick wasn't as impressive. Yes, Gill had been receiving plenty of hype for months, but his stock was falling lately after a less-than-mindblowing performance at the combine and injury rumours. Sure, he could still turn out to be a great defensive lineman, but there were others in this draft still available who looked more promising from this corner, including the guy Saskatchewan grabbed two picks later (Ainsworth). e-mail. Remember, part one of this evaluation is here.